Pedal installation is a fairly simple task, but must be done carefully and correctly. Of course, all power to the bike goes through the pedals, and that means that these small bindings with narrow axles take an enormous amount of strain. An incorrectly installed pedal can ruin a crankset and cause serious injury. Pedals are installed with either a pedal wrench or a 6-8mm allen wrench. 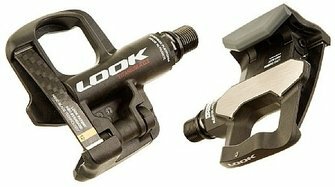 Newer road pedals tend to only accept allen wrenches, while platform pedals often require a pedal wrench; some pedals accept both. You'll also need a little grease for proper installation. Your drive side (right) pedal is conventionally threaded, which means it's tightened by rotating the axle clockwise—in other words: righty tighty, lefty loosey! The non-drive (left) pedal is reverse threaded and tightens when rotated counter-clockwise—so, lefty tighty. This is so the pedal won't be loosened by the pedaling motion. Losing a pedal mid-stroke could be disastrous! Liberally grease the pedal threads. Begin threading the pedal into the crank with fingers. Use a wrench to continue to tighten pedal. Work slowly and ensure it is threaded straight. Finish tightening pedals; most pedal manufacturers recommend a torque of ~300 in-lbs. WARNING: It is absolutely essential that a pedal is threaded in straight. A correctly threaded pedal will give very little resistance when tightening. If you're getting a lot of resistance, something is wrong! Cross threading can ruin a crank and create a dangerous situation on the road, as it results in a pedal not properly secured to the crank. Work slowly; if you encounter resistance, back the pedal out and start over. Pedal removal is pretty simple: unscrew the pedal (drive counter-clockwise, non-drive clockwise, of course). However, pedals typically get tighter when they are on a bike. Getting enough leverage to initially loosen the pedal can be tricky. A work stand comes in very handy for positioning the bike so you can get advantageous leverage. For any questions regarding pedal or tool selection, contact us at [email protected] or 1-800-682-0570.